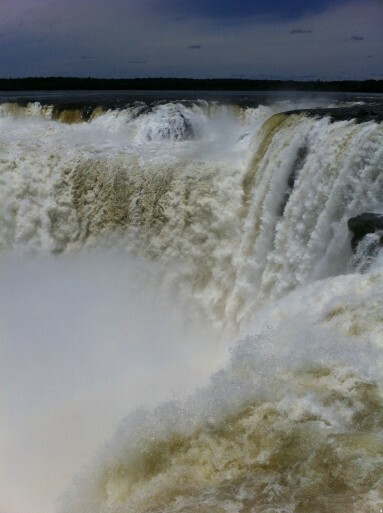 The first time my boyfriend Steve told me about his visit to Iguazu Falls, I immediately added it to my Bucket List. 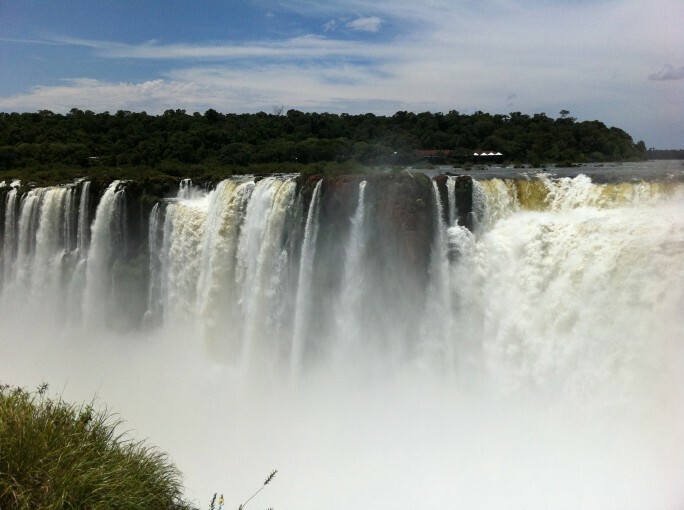 One of the world’s largest waterfalls straddling the border of Brazil and Argentina sounded like a force of nature too powerful to neglect on my upcoming solo trip to Buenos Aires. 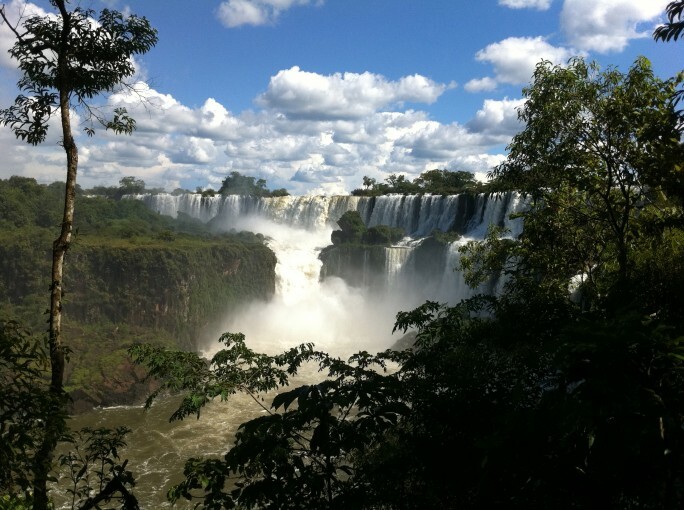 Though it was 680 miles north, Iguazu fascinated me, so I took a break from the tango and Eva Peron postcards that dominate Argentina’s capital to travel 20 hours by bus on a whirlwind trip to Puerto Iguazu. This small Argentine city on the border of Brazil is a quaint little tourist haven filled with quiet cafes and buzzing hostels. 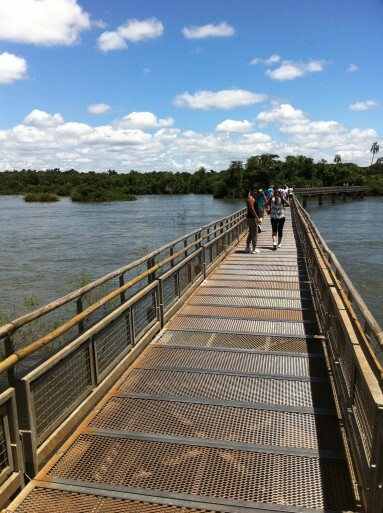 But it’s real claim to fame is that it’s the jumping off point for Iguazu peepers all eager to see the falls. After another bus ride from Puerto Iguazu (this one blessedly only ten minutes), and paying my entry fee (about $30) at Iguazu National Park, I rode the small train from the park’s entrance deep into the heart of the Iguazu rainforest. Having never been to Niagra or Victoria or any of the world’s major waterfalls before, I hardly knew what to expect. I anticipated something massive. Something loud. Something life changing, even. The train dumped the eager crowd and from there, a metal pathway filed tourists over the wide river marshes to the largest and most ominously named of the many falls that make up Iguazu–the Devil’s Throat. Vibrant tropical birds and coatis (long tailed creatures that resemble lemurs) frolicked in the trees and along the path, while scaly caimans chilled out in the murky water below. 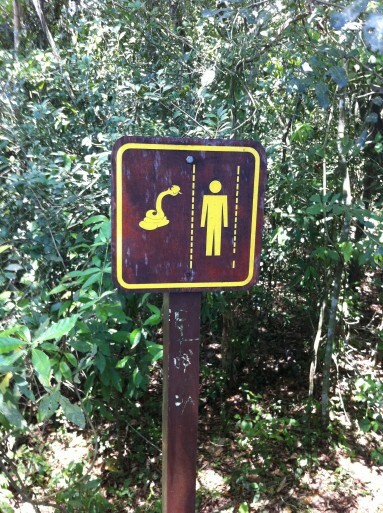 Signs warned of other slithery creatures (shudder!) lurking in the vines above, causing me to walk with a stoop the rest of the day. But reptiles aside, I was here to see the falls and I would not be daunted. Suddenly, I heard a distant roar. The noise grew louder and more thunderous with every step. 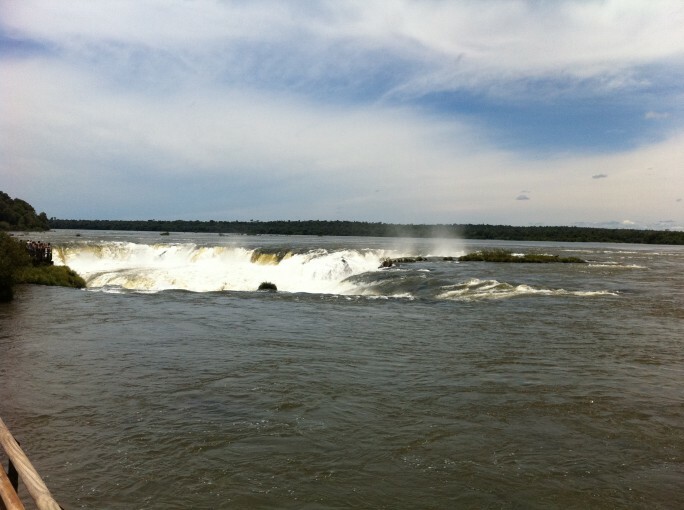 Then I saw a horseshoe shaped hole in what was otherwise the rippling surface of the Iguazu River. That massive hole spanning 490 feet is where the water tumbles over 269 feet and separates the upper and lower Iguazu Rivers. This mighty crash of water was the loudest noise I have ever heard. To stand on the viewing platform perched at the edge of Devil’s Throat felt precarious. But to stare down into the churning white void was undeniably exhilarating. Tourists vied for the best place along the rail to photograph this natural wonder, but I stood transfixed at the grandeur of the scene before me. It’s beauty lies in the monstrous intensity of its power. Staring at something so colossal can make a person feel small and insignificant, or, it can send a super charged wave of awe that things so incredible exist in our world. For me it was the latter, and it reinforced for me that the reason I love to explore the planet is for moments like these. Besides the main horseshoe of falls directly below me, across the chasm on the Brazil side, water streamed over the cliff to join the Lower Iguazu River far below. Mist cooled my sweating face as I watched hundreds of rainbows dancing on the vapor kicked up by the fall’s intense churning. I stood gazing at the fury of the rushing water for what seemed an eternity, but then I remembered that there were about 275 more waterfalls to see before the day was out. I spent the rest of my visit exploring the 457,792 acre park, ooh-ing and ah-ing as each new waterfall plunged over rocky outcroppings. 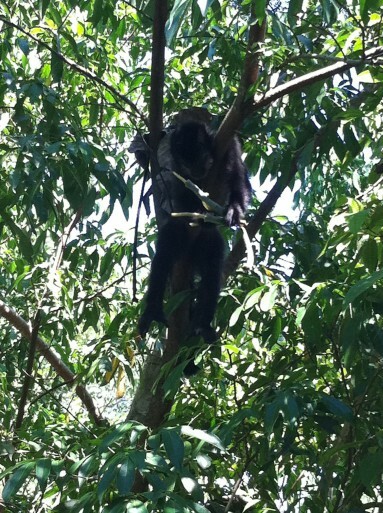 Monkeys played above me while clouds of bright yellow butterflies swarmed gracefully through the tepid air. The day wore on as I determined to see as much as I could before it was back to my hostel and then back on the bus to Buenos Aires. The tropical heat was almost unendurable, it was February–summer in the southern hemisphere. But I gladly endured the interminable stream of sweat pouring from my brow in order to take in Iguazu, the most amazing natural wonder I have ever seen. 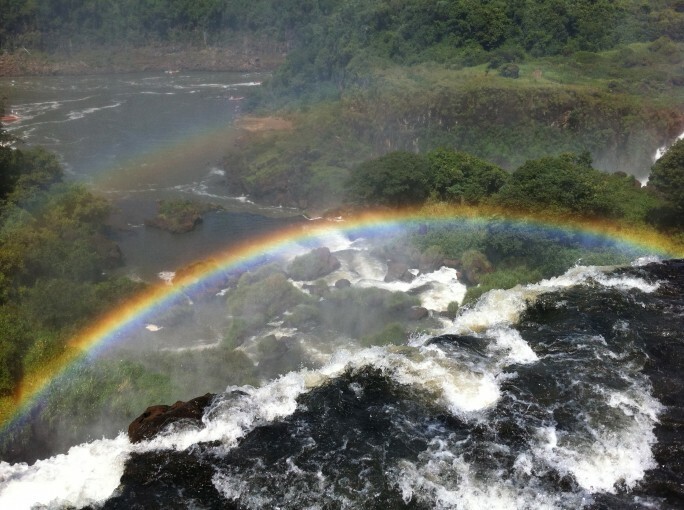 Note: My paltry words simply cannot do Iguazu justice, so you’ll just have to add it to your own Bucket List and see it for yourself. Leslie Patrick is a perpetual nomad and freelance writer focusing on travel and culture. Her work has appeared in AFAR, Marie Claire, Salon, Hemispheres and Monocle. Leslie has lived and worked in North America, South America and Asia, and her adventures span nearly 40 countries. Where in the world is Leslie now? Find out on her travel blog, The Chic Adventurer. Beautiful pictures and great article! I especially love the last one….amazing! 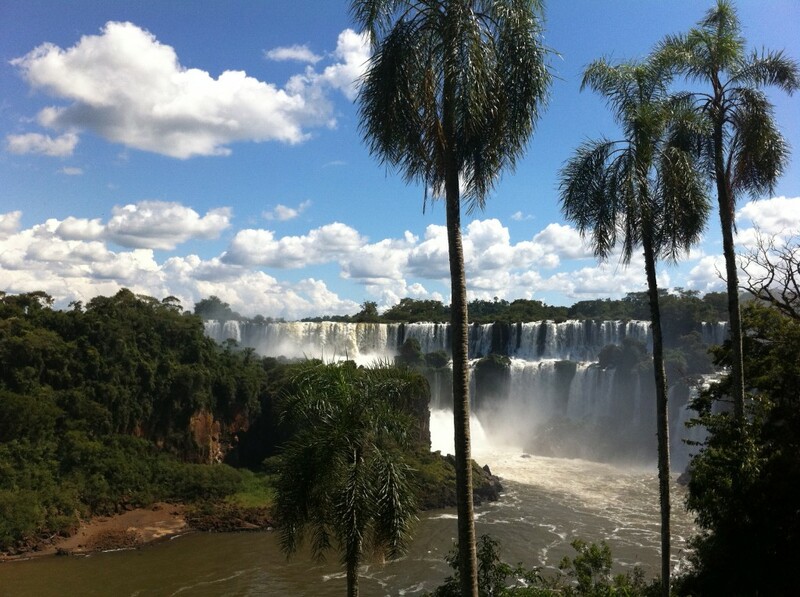 Iguazu is on my bucket list for sure! Your photos make it look both beautiful and intimidating; I’m looking forward to feeling awed standing beside it like you did. Incredible. To see animals around us we see only in zoos usually, hearing and seeing and experiencing wonders of the world such as these waterfalls, that must be amazing. Without this post, this would be a beautiful slice of this world I’d never have experienced!